Diagnosis of Heel Pain Achilles Tendonitis can often be diagnosed in a podiatry office with a thorough clinical exam. If it is hard to tell by inspection, then ultrasound or MRI can be useful. First we must make sure there is not an acute rupture of the achilles tendon. An excellent test is the calf squeeze test.Next we test for what causes pain to the tendon. Even single‐leg heel raises are sufficient to cause pain. True tendon pain is almost always found just in the tendon itself. It is important to rule out other diagnoses such as impingement of the back of the ankle, peroneal tendonitis, dilocation of flexor tendons, os trigonum syndrome, an accessory soleus muscle, nerve irritation or systemic problems like autoimmune conditions or lower back problems that may refer pain. Treatment of tendonopathy in the foot There are many marginally effective treatments offered for the care of painful tendons: Cortisone injections physical therapy with eccentric exercise glyceryl trinitrate patches electrical stim, ultrasound, electrotherapy (microcurrent and microwave) sclerosing injections non‐steroidal anti‐inflammatory drugs (NSAIDs). However my favorites include conservative treatments as the initial treatment. They consists of a many faceted approach that may include a combination of rest (complete or modified activity), casting,medication (NSAIDs, corticosteroids), orthotic treatment (heel lift, change of shoes, corrections of misalignments), stretching and strength training. It has been a general opinion that in about 25% of patients with chronic painful conditions located in the Achilles tendon, non‐surgical treatment is not successful and surgical treatment is needed. Before surgery for these resistant cases, ESWT, extracorporeal shock wave therapy has been found to be very effective . This has saved many patients from surgery. My treatments follow a step wise reasoned clinical path based on safety and effectiveness. Each patient gets a personalized approach based on their own unique circumstances. Different patients depending on age, job, activity, athleticism follow different paths. Acute and chronic presentations of achilles tendonitis are also treated differently. Non‐operative treatment methods Extracorporeal shock wave therapy Rest, NSAIDs, modification of shoes, orthotics, and physical therapy are successful in approximately 90% of those with mid‐tendon pain and pathology. 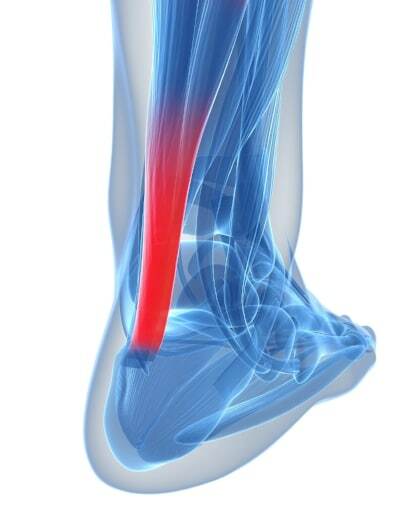 Insertional Achilles tendon pain is much harder to treat and good clinical results are achieved in approximately 30% of tendons with normal treatments. ESWT is a great alternative for these patients. READY TO SCHEDULE AN APPOINTMENT? Call us today 878-313-3338 to schedule at any of our four Podiatry Clinics in Beaver, Butler, or Allegheny County locations, including Podiatry offices Moon Township, Ambridge, Cranberry Township’s full service Podiatric office and our newest Foot Clinic, Beaver, PA Call now to talk to a foot care specialist 878-313-3338 ( FEET) Click Here to E-mail Dr. Christina Teimouri DISCLAIMER: email and contact forms not Monitored for emergencies; if you are having an emergency call 911. Existing patients please call our office directly with any important questions.